How Much Does a Dentist Make per Year? A dentist is a medical professional who provides preventive care and treats issues of the teeth, gums, and jaw. The average salary for a dentist in the US is $125,609 compared to C$103,425 (US$82,688) in Canada. Dentists in Australia earn AU$97,059 (US$75,783), followed by NZ$86,147 (US$61,750) in New Zealand, and £49,368 (US$56,286) in the UK. Income levels for dentists in South Africa are lower than the other countries reviewed in this guide at R429,039 (US$31,387), but well above earnings in India at Rs309,559 (US$4,722). Determining earning potential for a career in dentistry requires a review of the impact of geographic region, work setting, and professional experience. Annual and hourly wages for dentists with US dollar conversions are outlined in the chart below. Data and information from Payscale.com provides details on income and a career in dentistry. Read further to see the impact of geographic region, professional experience, and work setting on overall earning potential in this field. Dentists in the US earn between $75,000 and more than $212,000 per year. Bonus potential can surpass $48,000 and up to another $15,000 may be possible through commission pay. Some employers offer sizeable profit sharing incentives from $2,300 to nearly $209,000 annually. If eligible, overtime pay can reach $206 per hour in additional income. Dentists working in Denver, San Antonio, and Seattle report incomes that are higher than the national average by 33%, 17%, and 16%, respectively. Entry level dentists in Canada earn approximately C$59,000 per year, increasing more than three times with experience to nearly C$208,000 annually Additional bonus potential can reach C$49,000, and overall income can be further boosted through profit sharing of C$21,500. Some dentists work on an hourly rate of C$20 to C$100 per hour and overtime pay can add another $56 per hour in earnings. Dentists in the UK earn an annual starting salary of more than £29,000. There is a steady increase in salary, peaking for senior level professionals at a rate of approximately £97,000 per year. An additional £10,000 in bonus pay can be added to overall income. Some dentists work on an hourly rate of up to £74 per hour and overtime pay may range from £9 to £197 per hour above and beyond the base pay. Dentists working in Australia earn between AU$56,000 and more than AU$184,000 annually. Some may receive additional pay through bonus, profit sharing, and commission incentives that can range from AU$500 to AU$57,000. If working for an hourly rate, the pay ranges from AU$30 to AU$99 per hour and overtime pay is about AU$43 per hour in additional income. The starting salary for entry level dentists in New Zealand is just over NZ$50,000 per year. Incomes increase with additional experience to more than NZ$124,000 per year. Those paid by the hour can expect an hourly rate of approximately $41 per hour. The salaries for dentists in India range from Rs114,000 per year for entry level providers, increasing to nearly Rs1,200,000 for senior level professionals. Bonus and profit sharing potential ranges from Rs750 to nearly Rs300,000 in additional earnings. Some dentists are paid an hourly wage that averages Rs491 per hour and overtime pay can add another Rs95 to Rs7,000 per hour. South African entry level dentists earn about R233,500 per year compared to senior level dentists who bring home nearly R771,000 annually. There are some opportunities for bonus pay that can add a sizeable about to overall earnings, ranging from R5,152 to R48,479. Experience positively affects overall earning potential in all countries included in this guide. The first three years of one’s professional dentistry profession are regarded as entry level, training years. While dentists in India earn far less than their counterparts in other parts of the world, the impact of experience on overall income is the greatest in this country at Rs1,086,000 per year, or 953%. Triple digit growth is experienced in all regions included in this guide with 253% in Canada, followed by the UK at 234%, South Africa at 230% and Australia at 229%. Starting salaries in the US are higher in comparison to other parts of the world; however, income grows steadily throughout one’s career and reaches a level that is about $137,000, or 183% more, per year for senior level dentists. The smallest difference between entry level and senior level incomes is seen in New Zealand where dentists can expect growth of 148% in annual income. Dentists work in private practice, clinics, and educational institutions. Most dentists work in private practice either solo or with additional dental professionals. Some senior level dentists choose to dedicate part of their career to educational training. In the US, dental care is in the private sector, while in other parts of the world, a national healthcare system funds many dental positions with the private sector using the national pay scale as a guideline. Due to the structure of the funding for this position worldwide, there is little variance in salary by work setting. Those who are self-employed may have higher earnings and greater work flexibility compared to those employed by others. Note: If you are interested in this field, you can also go through our guide to the dental hygienist salary. Typical work hours for dentists are during normal business hours between Monday and Friday, while some dentists offer Saturday hours as well as extended hours in the early morning or evenings to accommodate patient availability. On-call hours may be required for emergency situations. Most dentists work full-time schedules while some choose to scale back to part-time hours or enjoy flexible scheduling. 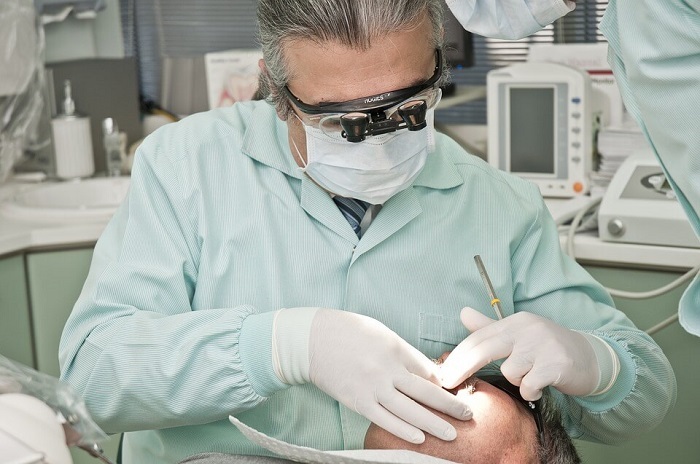 Dentists often have healthcare benefits that include coverage for medical, dental, and vision care; however, self-employed professionals may be required to provide these benefits themselves. Globally, bonus incentives are common and some see increased incomes through profit sharing and commission pay. Paid time off for vacation, sick time, and holidays are common. Employment opportunities for dentists are positive worldwide due to the global aging population and advanced dental treatments available. The US Bureau of Labor Statistics sees 18% growth potential between 2014 and 2024 for dentists, a rate that is much faster than other occupations in the US. To practice as a dentist, one must complete dental school and most countries require a written and practical test to fulfill licensing requirements. Dentists must complete post-graduate education; however, salaries are strong and provide a good return on educational and financial investment. Bonus pay and benefits are comprehensive, although as many dentists are self-employed, these benefits may be funded at their own expense. New dentists entering the career field should enjoy good employment opportunities and salary as growth in this field is expected to remain high in future years.